Yo! Here's the word... we're sad to say that Nap Attack is on a long term hiatus... Matt & Dan are playing with some new guys and Zach has been reunited with his previous Batars mate in their project "the Evening Paper". We'll let you know about any recordings that come about. Matt is also back doing his Stereoprimer stuff for those of you who can hang with goofy electro sounds. Hopefully we'll have more soon, but thats all for now. 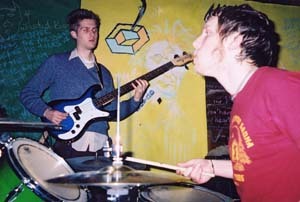 Our latest release is a 5 song cd called the "Choose Your own Adventure ep". 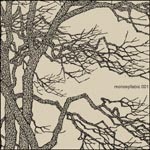 One song appears on this Monosyllabic Records compilation and feats. the Mercury Program, Maserati, Volta do Mar and many more. 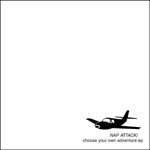 "Nap Attack have just released their debut, the Choose Your Own Adventure EP. The five song effort combines intricate, writhing, algebraic rhythms with equal measures of poetic reverie and angular bombast, to create compelling and challenging odysseys that delight in defying your expectations and preconceptions. Nothing here is as it seems and none of their songs will lead you where you think they will." "Careening through explosions, intricacies and unpredictable twists and turns, Arcata, California's Nap Attack create their own instrumental brand of "un-rock". The trio, featuring a lead bassist and rhythm guitarist, create a braided path of pummelling staccato and ultra-melodic passages. Complex, interesting guitar and bass work complements the erratic and precise drums, often experimenting with peculiar tempos and phase shift ideas earlier explored by avant-garde composers such as Philip Glass and Steve Reich." "Don't let their name fool you, either. Barely into their twenties, Nap Attack's powerful, high-energy shows and unique labyrinthine assault has already garnered heavy praise and led to performances with national stalwarts The Mercury Program, Maserati, Caesura, Six Parts Seven, Volta Do Mar, Town & Country, Mates of State, The Building Press, The Intima, Oma Yang, Kill Me Tomorrow, and Roots of Orchis."